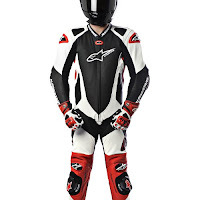 Alpinestars elevated their racing gear game yet again in the Fall of 2010 with new race suits and leather jackets that feature significant upgrades over their predecessors. In this post, we'll take a look at the Alpinestars GP Pro Race Suit and the GP Pro Leather Jacket. These two pieces replace the Alpinestars RC-1 Suit and leather jacket respectively. Alpinestars is pervasive throughout the world of motorcycle racing and this new line of gear will do nothing but solidify their reputation of producing quality gear for racers. 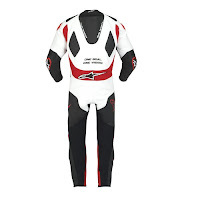 First up is our review of the Alpinestars GP-Pro Suit. We first got a peek of this suit about a month ago and it quickly became our favorite suit, in terms of value-for-price ($999.95), in the Alpinestars lineup. 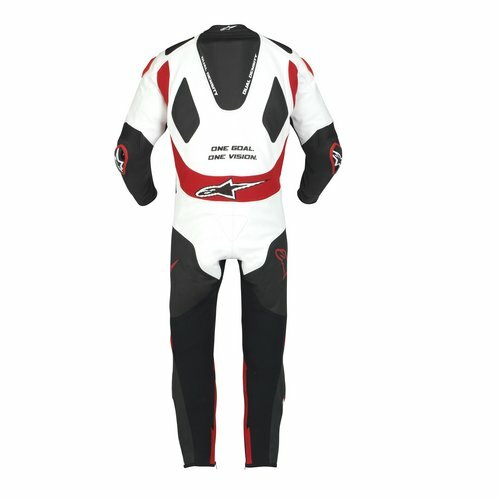 Doing everything the RC-1 Suit did and much more, the GP Pro Suit is the first non race replica suit from AStars to use external PU sliders on the shoulders, elbows and knees. The addition of an enormous U-shaped accordion stretch panel on the back of the suit dramatically improves comfort and flexibility when hitting the race position. The last major upgrade over the RC-1 is the connection system for the Bionic Back Race Protector, which now features three snaps for adjustability rather than the single-snap in years' past. In the shoulders, elbows, knees, and shins are CE certified GP-level protectors used in pro suits. It features a dual-density aerodynamic back hump and throughout the suit are accordion stretch panels for comfort and aramidic stretch panels for airflow and flexibility. The PE protective padding that comes standard in the chest is also upgradeable to Bionic Chest Guards. The rest: perforated leather paneling for airflow; calf expansion panels for accommodating fit; mesh lining with stretch paneling for snug fit; replaceable GP knee sliders; YKK auto-locking zippers. Next is our review of the Alpinestars GP Pro Leather Jacket. Essentially the top half of a two-piece race suit, the GP Pro Leather jacket replaces the extremely popular RC-1 jacket from Alpinestars. It offers the same upgrades as the suit: external PU sliders on the shoulders and elbows, a dual density back hump, and the multi-snap connection system for the Bionic Race Back protector. 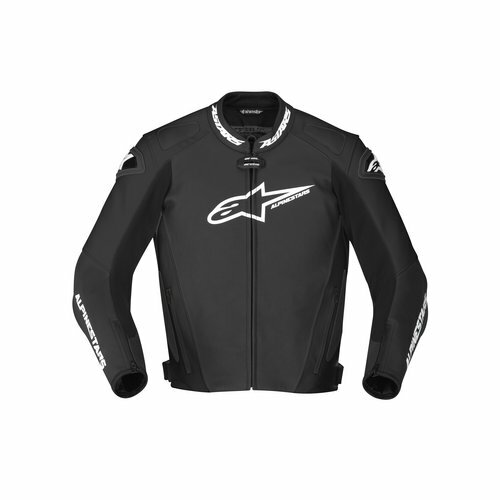 All in all, an excellent upper-echelon racing leather jacket from Alpinestars that pairs with any leather pants from their lineup via the 360-zip to create a two-piece race suit. We are stoked on the new race gear from AStars for Fall 2010. To see the complete collection, visit our Alpinestars Fall 2010 page at RevZilla.com. To see competitors of the GP Pro, visit our leather motorcycle jackets section and our race suits page. Stay tuned for our look at the Alpinestars Tech 1-R Leather Jacket & Tech 1-R Race Suit, the only piece higher in the food chain from AStars this year.